Spring is already on our doorstep and spring migration is going in full swing. We got convinced yesterday during one of our regular visits to the protected area Yatata (The Flocks) near Varna, which is our favorite in the area. Besides the first flock of about 150 White Storks, which soared overhead, rewarded us greatly and continued west, in the lake we had dozens of Pygmy Cormorants, nine species of ducks and diving ducks, including the globally threatened Ferruginous Duck, Gray Heron and White Heron, Marsh Harrier and even a Greater White-fronted Goose, probably late with migration. 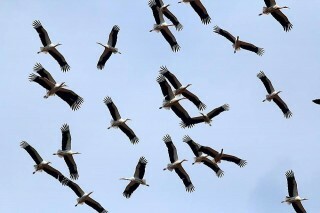 Yatata is the place with the great variety of birds in the region of Varna-Beloslav complex in all seasons. It supports over 220 species of birds, including 6 species threatened with extinction worldwide, such as the Red-breasted Goose (Branta ruficollis), the Dalmatian Pelican (Pelecanus crispus), The White-tailed Eagle (Haliaeetus albicula) and others. The site plays an important role for the breeding Marsh Harrier, Black-winged Stilt and Gadwall. During migration and wintering, it is among the most important places in Bulgaria for many rare and endangered species, such as the Pygmy Cormorant, The Ferruginous Duck, The White Stork, the Glossy Ibis and The Whooper Swan. Unfortunately, we were badly surprised by the polluted observation platform on the side of the road Varna – Beloslav, which we have repeatedly cleaned and which we had even laid out with a wooden platform some time ago. Also, the old information boards are now only faded signs on empty structures. We hope to be able to jointly fix what was destroyed intentionally or unintentionally. Soon we will launch donor program for cleaning and maintaining this unique site. We already have the support of our partners from Neophron Tours and Thousand Voyages, and we hope to receive yours too. Please follow our initiatives and campaigns here.